Exclusive: Wharfedale unveils Diamond 200 speaker series | What Hi-Fi? Arguably the most headline-grabbing model in the range is the Diamond 220, the direct replacement for the Diamond 121 bookshelf speaker, itself the latest version of Wharfedale's classic Diamond bookshelf speaker. The new model claims to feature significant aesthetic and construction upgrades. The 121's cabinet was a mixture of MDF and chipboard wrapped in vinyl, while the new 220s feature particleboard, sandwiched between MDF. Wharfedale says this allows the vinyl wrap to be applied more easily, resulting in an improved finish, which is something we criticised in our original Diamond 121 review. 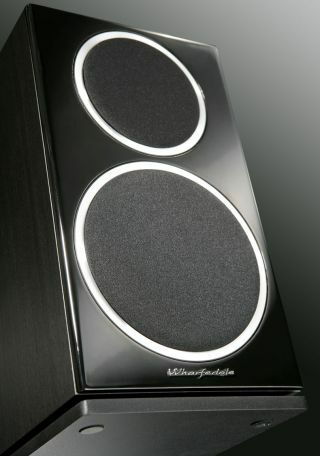 Wharfedale also claims that additional improvements to the crossover network, bass motor system and slot-loaded port provide "a touch more sonic detail and an even greater sense of musical communication". The rest of the range comprises the Diamond 210 miniature standmounts, the 230, 240 and 250 floorstanders, and the 220C centre speaker. These promise to deliver the same cosmetic and sonic improvements as the Diamond 220s: a new cabinet construction, new lacquered baffle design, improved bass motor system and a new slot-loaded distribution port for improved airflow. They also feature upgraded crossover networks to improve integration between the drive units. The Wharfedale Diamond 220 standmounts will be available from 1st October for £200, while the rest of the Diamond 200 series will be available from December. Further pricing information has yet to be released. Stay tuned to What Hi-Fi? for our exclusive review of the new Wharfedale Diamond 220 speakers, which will appear in our special Awards issue, on sale 14th October.